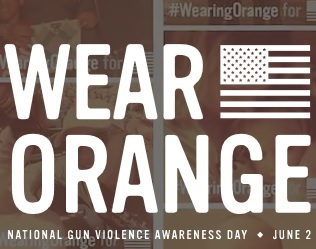 Richard Blumenthal and Chris Murphy, our two United States Senators from Connecticut, are participating in this upcoming campaign to “Wear Orange” on June 2nd, 2015 for the inaugural “National Gun Violence Awareness Day”. Wear Orange is a new campaign that amplifies existing efforts to reduce gun violence in America and helps honor the 88 Americans whose lives are cut short by gun violence every day. For more information on the “Wear Orange” campaign for the “National Gun Violence Awareness Day” click here to visit their main website. There you can see their campaign overview and a list of partners which are supporting the effort. To learn about the history and creation of the “Wear Orange” effort you can view this article in the “Chicago Sun Times” by clicking here. This entry was posted in News and Events and tagged #WearingOrange, Chris Murphy, Connecticut., National Gun Violence Awareness Day, Richard Blumenthal, United States Senate, Wear Orange. Bookmark the permalink.